Welcome to The Goose Is Out! 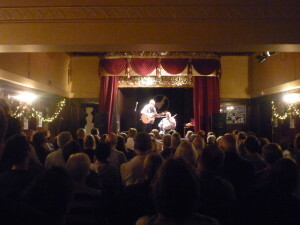 We are Nyge and Sue, and we run regular folk music concerts, club nights and singarounds, all in Nunhead, London SE15. If you’d like to receive our newsletter and be amongst the first to hear the latest Goose news and bookings, just subscribe via the link on the right! Well, we have lots of other things on apart from concerts, but our concerts are the only things we sell advance tickets for. You can either buy tickets online (see below) or at The Ivy House bar. However if we are close to selling out, we stop selling tickets at The Ivy House to prevent overselling. Subscribers to our newsletter will receive updates on the ticket situation, which we will also post on our home page here if selling out looks likely. You can subscribe via the link on the right of this page! Click here to buy advance online tickets for our concerts! Please note that there may sometimes be more than one page of our concerts on WeGotTickets! Click here to find out more about what our concerts are like! Click here for more information about what’s on, including our club nights and Singarounds! 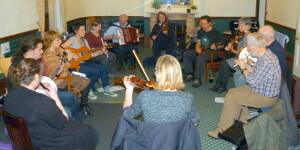 The Goose does not run sessions but if you are looking for one locally, South London Tunes Collective meets on the last Monday of the month for a friendly and informal session at The Crown and Greyhound in Dulwich Village. All acoustic melody instrument players are welcome.